The International Food Expo is an opportunity for USI’s international students to share the cultural diversity, customs and cuisine of their home country with the USI community and the public. In addition to tasty dishes from around the world, entertainment will include dances, musical performances, as well as a fashion show of traditional, cultural attire. 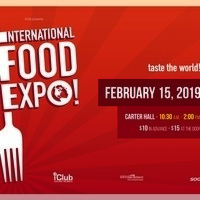 Tickets can be purchased in advance for $10 from the Center for International Programs office in the University Center East, Room 1235, or at the door on the day of the Expo for $15. A portion of the proceeds will be donated to a local charity. USI students are able to purchase tickets from the Eagle Access Office with their USI ID using Munch Money. For additional information, contact Nicole Vernon at nmvernon@usi.edu or 812-228-5092.